Summary Simultaneous dual-band (N600) business access point that can function standalone AP, managed AP and AP controller. The ZyXEL NWA3560-N is a 802.11n Access Point (AP) designed to scale from a single AP up to 24 APs and 500 wireless end devices. It has two flexible dual-stream, dual-band radios that each can run on either 2.4 or 5.0 GHz band, support up to 8 SSIDs per radio and provides a host of other wireless network features. The NWA3560-N can be configured to run as a standalone AP (= default), managed AP or as a controller. I'll first cover features and functionality of a single NWA in standalone mode. I'll then review two NWAs, one in controller mode and another in managed mode. The NWA is housed in white plastic and measures 7.8” L x 5.5” D x 1.9” H. There are four indicator lights on the top of the device for power, Ethernet, and on/off status of the two wireless radios. It has no cooling fans so runs completely silent. I noticed it does get quite warm to the touch, though. There are four hinged dual-band antennas that come with the device. Simply screw the antennas onto the RP-SMA connectors and position them as desired. The NWA has four plastic feet so it can sit on a desk or shelf. It also is wall-mountable with two holes in the back of the chassis for hanging the device. The NWA comes with a power brick, but the device can also be powered by a standard PoE switch (both 802.3af and 802.3at are supported). I powered my test NWAs off a NETGEAR GS510-TP PoE capable smartswitch. 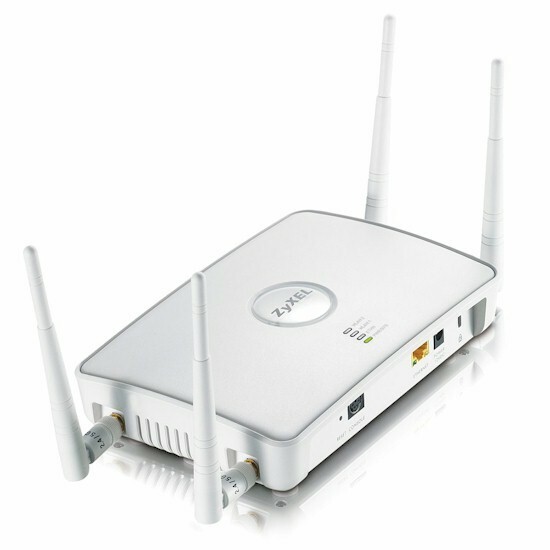 The NWA3560-N is a feature-rich wireless device. I put together the below list from the ZyXEL data sheet and its configuration options. Figure 1 is a shot of the mainboard of the NWA3560-N. The main components include a Cavium OCTEON CN5020 (500MHz) processor, 32 MB Flash, 256 MB SDRAM and Qualcomm-Atheros AR9220 WLAN chipsets on Z-Com AN-622 mini-PCI modules. I couldn't identify the Ethernet device used, but it is 10/100, not Gigabit 10/100/1000. The NWA can be configured via web GUI, as well as via the command line (CLI). Table 1 below lists the various menu options available in the NWA web GUI with the device configured for Standalone mode. I found the menus on the NWA easy to navigate. The main web interface has a top bar with 6 choices. Bringing up the help option on the top bar provides an indexed and searchable copy of the NWA manual. Along the side of the web interface are four menu options where all the configuration and operation options reside. CLI access to the NWA is via an IP connection or console port. By default, SSH access is enabled and Telnet is disabled. Common CLI tools such as “?”, command history, and tab-complete are available to simplify CLI configuration. I've included a shot of the Dashboard in Figure 2 to give you the look and feel of the ZyXEL configuration screens. The Dashboard provides a nice look at key performance indicators, such as CPU, Memory, and Flash status, as well as number of connected APs (when in controller mode) and stations.